Although we are currently sweltering in the heat and humidity of summer. I’m optimistic that the cooler weather of fall will be here in just a couple months. Aha.. Autumn, fall leaves cool air and crisp apples. I would suppose that this dessert would be wonderful on a crisp Autumn evening. It’s a season that brings about an excess of apples from upstate. Heat the milk on a low flame and melt the stick of butter into in. Once this is done let it cool to room temperature. 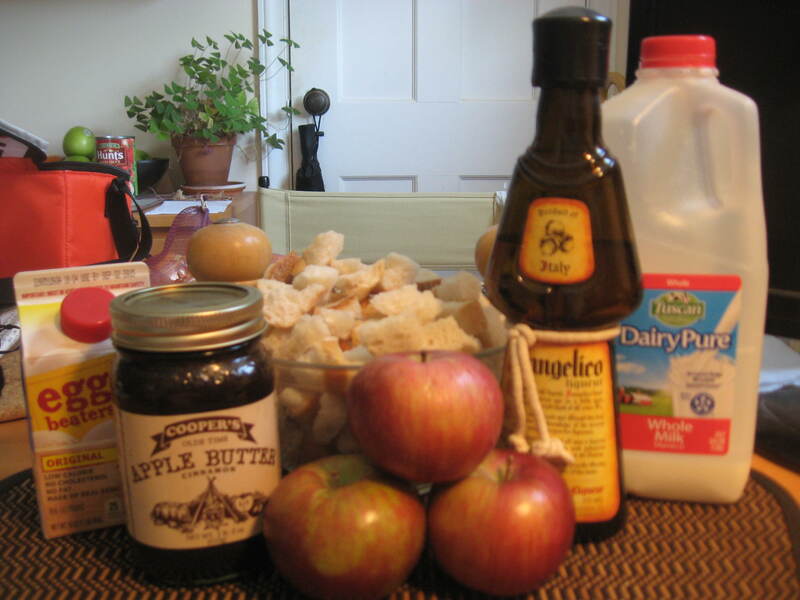 In a large mixing bowl combine the eggs, brown sugar, liqueur, apple butter and cinnamon. Then slowly add the milk and butter mixture stirring it in. You want to make sure the this mixture is cool enough so that it doesn’t start cooking the egg mixture its being added to. Once all the this is combined add in the bread cubes. Use your fingers to mix this up making sure the bread absorbs all the liquid. Trust me, it’s perfectly acceptable to use your clean hands as kitchen utensils! I grease an eight inch square pan with butter, then pour the bread mixture in and bake in the oven for 30 to 40 minutes. Once you remove it from the oven, let it cool just a bit and serve warm with whipped cream.